It has been suggested that Cut (gems) be merged into this article. (Discuss) Proposed since December 2018. A diamond cut is a style or design guide used when shaping a diamond for polishing such as the brilliant cut. Cut does not refer to shape (pear, oval), but the symmetry, proportioning and polish of a diamond. The cut of a diamond greatly affects a diamond's brilliance; this means if it is cut poorly, it will be less luminous. In order to best use a diamond gemstone's material properties, a number of different diamond cuts have been developed. A diamond cut constitutes a more or less symmetrical arrangement of facets, which together modify the shape and appearance of a diamond crystal. Diamond cutters must consider several factors, such as the shape and size of the crystal, when choosing a cut. The practical history of diamond cuts can be traced back to the Middle Ages, while their theoretical basis was not developed until the turn of the 20th century. Design creation and innovation continue to the present day: new technology—notably laser cutting and computer-aided design—has enabled the development of cuts whose complexity, optical performance, and waste reduction were hitherto unthinkable. The most popular of diamond cuts is the modern round brilliant, whose facet arrangements and proportions have been perfected by both mathematical and empirical analysis. 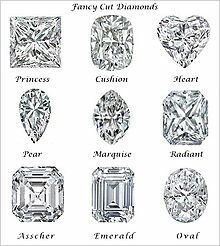 Also popular are the fancy cuts, which come in a variety of shapes, many of which were derived from the round brilliant. A diamond's cut is evaluated by trained graders, with higher grades given to stones whose symmetry and proportions most closely match the particular "ideal" used as a benchmark. The strictest standards are applied to the round brilliant; although its facet count is invariable, its proportions are not. Different countries base their cut grading on different ideals: one may speak of the American Standard or the Scandinavian Standard (Scan. D.N. ), to give but two examples. Brilliance can be divided into the definitions external brilliance and internal brilliance. The former is the light reflected from the surface of the stone—its luster. Diamond's adamantine ("diamond-like") luster is second only to metallic (i.e., that of metals); while it is directly related to RI, the quality of a finished gem's polish will determine how well a diamond's luster is borne out. Internal brilliance—the percentage of incident light reflected back to the viewer from the rear (pavilion) facets—relies on careful consideration of a cut's interfacial angles as they relate to diamond's RI. The goal is to attain total internal reflection (TIR) by choosing the crown angle and pavilion angle (the angle formed by the pavilion facets and girdle plane) such that the reflected light's angle of incidence (when reaching the pavilion facets) falls outside diamond's critical angle, or minimum angle for TIR, of 24.4°. Two observations can be made: if the pavilion is too shallow, light meets the pavilion facets within the critical angle, and is refracted (i.e., lost) through the pavilion bottom into the air. If the pavilion is too deep, light is initially reflected outside the critical angle on one side of the pavilion, but meets the opposite side within the critical angle and is then refracted out the side of the stone. This is the most populous category of fancy cut, because the standard round brilliant can be effectively modified into a wide range of shapes. Because their facet counts and facet arrangements are the same, modified brilliants also look (in terms of brilliance and fire interplay) the most like round brilliants. There are several older modified brilliant cuts of uncertain age that, while no longer widely used, are notable for history's sake. They are all round in outline and modify the standard round brilliant by adding facets and changing symmetry, either by dividing the standard facets or by placing new ones in different arrangements. These cuts include: the King and Magna cuts, both developed by New York City firms, with the former possessing 86 facets and 12-fold symmetry and the latter with 102 facets and 10-fold symmetry; the High-Light cut, developed by Belgian cutter M. Westreich, with 16 additional facets divided equally between the crown and pavilion; and the Princess 144, introduced in the 1960s, with 144 facets and 8-fold symmetry. Not to be confused with the mixed Princess cut, the Princess 144 cut makes for a lively stone with good scintillation; the extra facets are cut under the girdle rather than subdivided. The extra care required for these sub-girdle facets benefits the finished stone by mitigating girdle irregularity and bearding (hairline fracturing). Today, with the increased understanding of light dynamics and diamond cutting, many companies have developed new, modified round brilliant cut diamonds. If designed correctly, these extra facets of the modified round brilliant could benefit the overall beauty of a diamond, such as in 91 facet diamonds. The Asscher Cut, a square modified Emerald Cut, is also popular. Various forms of the rose cut have been in use since the mid-16th century. Like the step cuts, they were derived from older types of cuts. The basic rose cut has a flat base—that is, it lacks a pavilion—and has a crown composed of triangular facets (usually 12 or 24) rising to form a point (there is no table facet) in an arrangement with sixfold rotational symmetry. The so-called double rose cut is a variation that adds six kite facets at the margin of the base. The classic rose cut is circular in outline; non-circular variations on the rose cut include the briolette (oval), Antwerp rose (hexagonal), and double Dutch rose (resembling two rose cuts united back-to-back). Rose-cut diamonds are seldom seen nowadays, except in antique jewelry. Like the older style brilliants and step cuts, there is a growing demand for the purpose of repairing or reproducing antique pieces. Related to the rose cut, and of similar antiquity, is the mogul cut, named after the Great Mogul diamond that was the most famous example of its type. Like the classic rose cut, the mogul cut also lacks a pavilion and a table facet, and its crown is also composed of triangular facets rising to form a point. But in mogul-cut diamonds the rotational symmetry is normally fourfold or eightfold, and the eight apical facets are girded by two or more additional rings of facets. 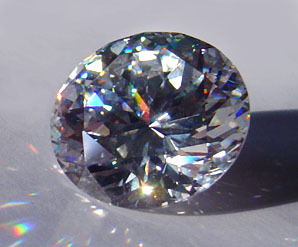 The modern mogul cut evolved from earlier faceting techniques originally used to disguise internal flaws in very large stones; in the modern day this cut has also become rare, but still finds occasional use where it is less important to showcase a stone's internal clarity, as with the black and internally opaque Spirit of de Grisogono Diamond. The "Cut" of the "4 Cs" is the most difficult part for a consumer to judge when selecting a good diamond. This is because some certificates will not show the important measurements influencing cut (such as the pavilion angle and crown angle) and will not provide a subjective ranking of how good the cut was. The other 3 Cs can be ranked simply by the rating in each category. 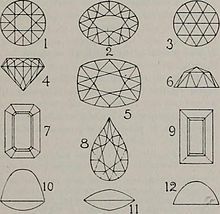 It requires a trained eye to judge the quality of a diamond cut, and the task is complicated by the fact that different standards are used in different countries (see proportions of the round brilliant). The relationship between the crown angle and the pavilion angle has the greatest effect on the look of the diamond. A slightly steep pavilion angle can be complemented by a shallower crown angle, and vice versa. This trade-off has been quantified by independent authors, using various approaches. So-called "painted" girdles have thinner girdles where the main facets touch the girdle than where adjacent upper girdle facets touch the girdle. These stones have less light leakage at the edge of the stone (for a given crown angle, pavilion angle, and table ratio). The AGS standards changed in 2005 to better match Tolkowsky's model and Octonus' ray tracing results. The 2005 AGS standards penalize stones with "cheated" girdles. They grade from 0 to 10, with ranges corresponding to single descriptive words: Ideal (0), Excellent (1), Very Good (2), Good (3-4), Fair (5-7), Poor (8-10). The GIA began grading cut on every grading report for round brilliant beginning in 2006 based on their comprehensive study of 20,000 proportions with 70,000 observations of 2,000 diamonds. The single descriptive words are as follows: Excellent, Very Good, Good, Fair, and Poor. During the diamond cutting process, the diamond cutter wants to get the heaviest diamond out of a rough stone. However, this can come at the cost of lowering cut grade. If a diamond is too deep, the carat weight will increase but result in a loss of brilliance due to light leakage. Diamond cutters have to contend with working a stone to its best finished form with the least amount of waste. This strategy depends on the quality of the stone and its final proportions. If two diamonds of equal weight are inspected there can be a noticeable difference in size when viewed from above; arguably the most important view. A well cut 0.90ct diamond for example could have the same width as a poorly cut 1.00ct diamond. This phenomenon is known as spread. Cut also affects the color of a diamond. This is especially important when considering fancy colored diamonds, where the slightest shift in color could vastly affect the price of the diamond. Most fancy colored diamonds are not cut in to round brilliants, because whereas the round brilliant is prized for its ability to reflect white light, the most important characteristic in a fancy colored diamond is its color, not its ability to reflect white light. ^ a b c Marcel Tolkowsky (1919). Diamond Design. Spon & Chamberlain. ^ "What did Marcel Tolkowsky really say?". Archived from the original on 2006-08-27. ^ "Russian gemmological server". Retrieved 2009-08-08. ^ "Crown and Pavilion Angles". www.pricescope.com. PriceScope. Retrieved 28 November 2016. ^ Diamond shapes. Diamond shapes. Retrieved on 2013-08-20. ^ Peter Yantzer, American Gem Society Laboratories. "The Effects of Indexed Upper Half Facets". ^ Marcel Tolkowsky (1919) Diamond Design, Figure 37. Spon & Chamberlain. Folds.net. ^ W. Eulitz (1968). "The Optics of Brilliant-Cut Diamonds". Gems and Gemology. 12 (9): 263–271. ^ Yariv Har (June 2, 2009) "Gemstone with 81 facets". United States Patent D593,440. ^ Paulsen, Jasper. Graph of "How pavilion angle and girdle thickness affect the best crown angle and table size". ^ Holloway, Garry, and others. Pressing "Go" on the Holloway Cut Adviser web service produces a graph of HCA scores for various crown and pavilion angles, with a user-specified table ratio. ^ Harding, Bruce. Faceting Limits. ^ a b Naturski, Sebastian. "The Diamond Cut – How to Maximize your Diamond's Sparkle". Your Diamond Teacher. Retrieved 28 November 2016. ^ "New GIA Diamond Grading Report and GIA Diamond Dossier®". diamondcut.gia.edu. Gemological Institute of America Inc. Retrieved 28 November 2016. Malecka, Anna (2017). Naming of the Koh-i-Noor and the Origin of Mughal-Cut Diamonds, The Journal of Gemmology, no. 4. 38(8). OctoNus Software has posted several diamond cut studies, by various authors. OctoNus, Moscow State University, Bruce Harding, and others have posted work there. Holloway, Garry (2000-2004). 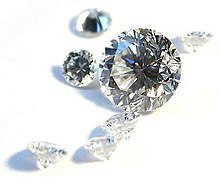 HCA: defining ideal cut diamonds is a detailed explanation of the "Holloway Cut Adviser". A web service that uses this software is available. Blodgett, Troy; et al. (GIA) (2006) "Painting and Digging Out", GIA article 2006. A gemstone is a piece of mineral crystal which, in cut and polished form, is used to make jewelry or other adornments. However, certain rocks and occasionally organic materials that are not minerals are also used for jewelry and are therefore often considered to be gemstones as well. Most gemstones are hard, but some soft minerals are used in jewelry because of their luster or other physical properties that have aesthetic value. Rarity is another characteristic that lends value to a gemstone. Facets are flat faces on geometric shapes. The organization of naturally occurring facets was key to early developments in crystallography, since they reflect the underlying symmetry of the crystal structure. Gemstones commonly have facets cut into them in order to improve their appearance by allowing them to reflect light. A brilliant is a diamond or other gemstone cut in a particular form with numerous facets so as to have exceptional brilliance. The shape resembles that of a cone and provides maximized light return through the top of the diamond. Diamond clarity is the quality of diamonds that relates to the existence and visual appearance of internal characteristics of a diamond called inclusions, and surface defects, called blemishes. Clarity is one of the four Cs of diamond grading, the others being carat, color, and cut. A diamond simulant, diamond imitation or imitation diamond is an object or material with gemological characteristics similar to those of a diamond. Simulants are distinct from synthetic diamonds, which are actual diamonds having the same material properties as natural diamonds. Enhanced diamonds are also excluded from this definition. A diamond simulant may be artificial, natural, or in some cases a combination thereof. While their material properties depart markedly from those of diamond, simulants have certain desired characteristics—such as dispersion and hardness—which lend themselves to imitation. Trained gemologists with appropriate equipment are able to distinguish natural and synthetic diamonds from all diamond simulants, primarily by visual inspection. PrincessPlus, also known as "The Brighter Princess Cut", is one of a number of new branded diamond cuts that have been developed over the last decade. The diamond is technically referred to as a modified princess cut. The bezel is a wider and usually thicker section of the hoop of a ring, which may contain a flat surface, usually with an engraved design, as in a signet ring, or a gem. The ring is normally worn to display the bezel on the upper or outer side of the finger. The word may also refer to a bezel setting for a stone, which is a general term for a setting holding the stone in place using a raised surrounding for the stone with a lip encircling and overlapping the edges of the stone, thus holding it in place. Modern bezel settings typically use a band of metal containing a groove and a flange to hold a watch crystal or gemstone in its setting. This was the earliest method of setting gemstones into jewelry, in historic examples often made by leaving a hole or slot in the ring with a thin lip which was bent over once the stone was inserted, holding it in place. A diamond is one of the best-known and most sought-after gemstones. Diamonds have been used as decorative items since ancient times; some of the earliest references can be traced to 25,000 - 30,000 B.C.